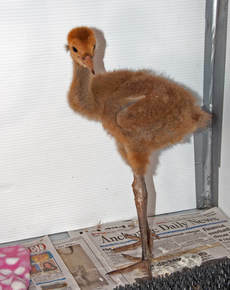 A call came in about a baby Sandhill Crane found caught inside a fenced dog pen. The parents had abandoned it when they could not get in to it. 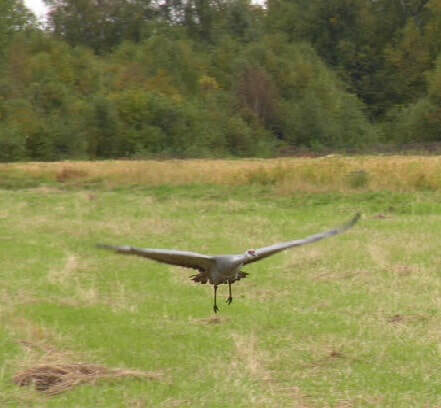 The crane was rescued and brought to Alaska WildBird Rehab Center. 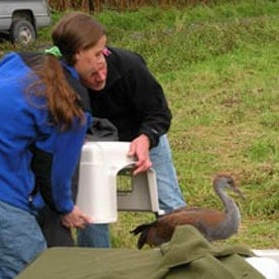 After consultation with the International Crane Foundation, the experts on all things crane, we were told that this baby was in a critical life stage, subject to imprinting on whoever provided food. 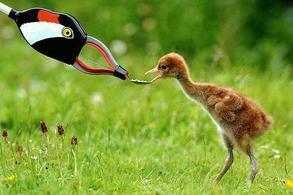 One of our volunteers took on the task of caring for the crane. It was fed through a small opening in the cage cover, so there was no sight of the human caretaker. 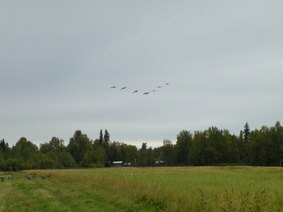 We took the crane to a field in Trapper Creek, where cranes gathered to fatten up before fall migration. 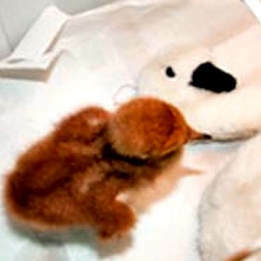 As soon as the crate was opened, the baby flew out, reacted to a flying crane yodel, and took off for the flock! Neighbors watched for it for several days, but it apparently immediately joined the flock and went off to a wild and free life!